BEWARE: Please note that we do not sell or rent visitor lists to third parties. Please do not respond to any emails offering to sell such lists, which are part of an industry-wide scamming issue. Click here for more details. Making new contacts and forging new working relationships is vital ingredient for success for every type of organisation - whether you are a large corporate, an established small or medium-sized business or an entrepreneur just starting your first venture. At Business Vision LIVE you will meet key decision makers from a diverse range of organisations, based right across Kent and beyond. Exhibiting at the event will raise awareness of your company and provide you with genuine sales leads to help you build your business. 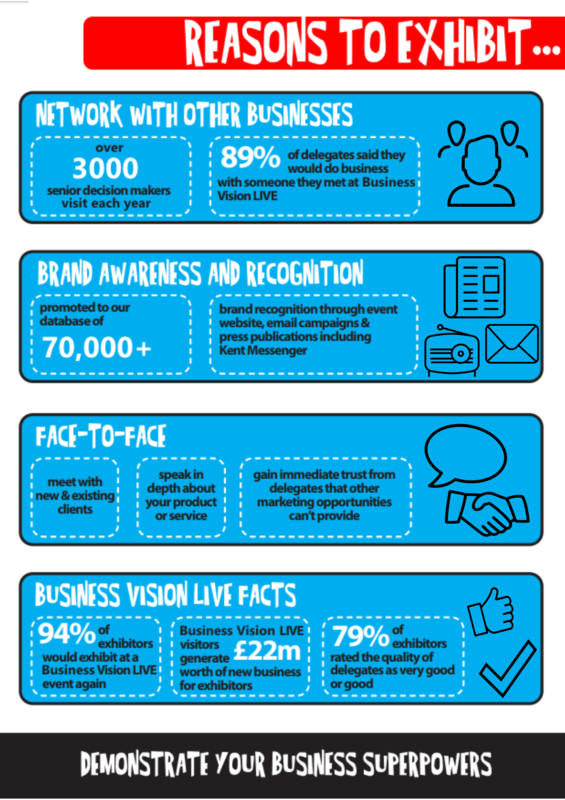 Over 3,000 visitors attend Business Vision LIVE each May and over half of these (53%) do not attend any other business shows. We have a package to suit every company and budget from fully inclusive stands to space only and additional sponsorship bolt-ons to workshop sessions. We will guide you through the whole process, from selecting the right stand to preparing literature and briefing staff. 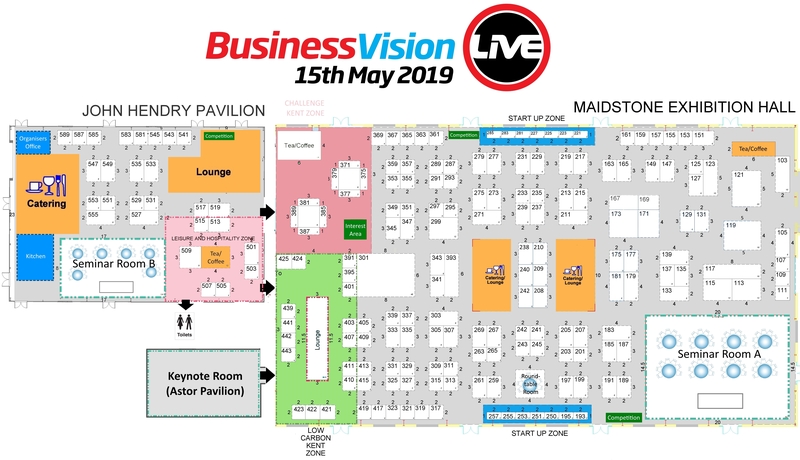 Our experienced Kent-based team are always available to answer any queries and will ensure you have the most positive and productive experience at Business Vision LIVE. Stands and Workshop packages are offered on a strictly first-come-first-served basis. The event includes specific zones within the exhibition that give delegates the opportunity to explore key areas of interest whilst offering further information, guidance and inspiration for your business. If you are interested in exhibiting in a specific zone please contact Emily. See the exhibitors that signed up for 2018 here. Business Vision LIVE is the most cost-effective event you’ll ever invest in. In addition to your stand, all packages include an entry in the official on-site Event Guide, listing on the event website and access to our exclusive pre-event masterclass, helping you to maximise your presence ensuring the very best return on your investment. To enhance the profile of your company and help get you noticed above your competitors, there are a number of additional sponsorship opportunities available. For full information, please contact us. Knockout Print are on hand to deal with the printing of your leaflets, brochures etc for your stand. See below for a blank floorplan of the event. Click here to view our FAQs on exhibiting. Or if you'd prefer, please fill in in our information request form and we will send across the information that you need.